This is my first "official" fall in New England. Having previously spent some days and weeks in the area in the past, I never experienced the full coming of the season on a day to day basis. The chill in the air that smells so clean. The army of birds flying over the lake near my house. Leaves changing their colors overnight like moving Technicolor pictures. And other experiences new to me too-caramel apples, pumpkin flavored coffees, and the quickness of the dark in Daylight Savings Time. Everything is slower and richer and more savory. So when my friend and design collaborator Rebecca Lien of http://fashioninfusion.blogspot.com started talking to me about the fall fashion trends she was working into her dressing, it got me to thinking about my own collections. What pair of my heels seems to suggest fall the most? 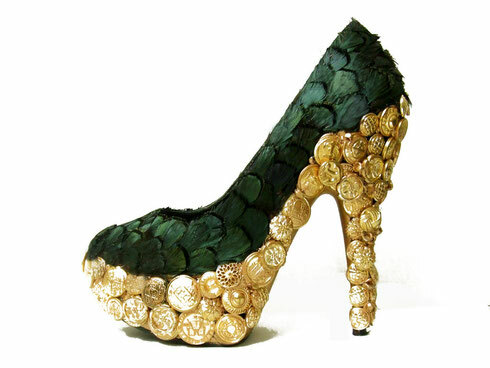 It did not take me long to answer my peacock feather and armor encrusted heel pumps called Fortuna. Inspired by the feeling of metals layered with soft feathers--I went down to NYC for some style shooting with Rebecca! Rebecca has a tremendous sense of street style that is unique to her. We share the same taste in fashion [for good spicy Taiwanese noodles from our country too! ], so we pulled some looks together and hit the pavement of her neighborhood in Queens. Edwin our photographer was with us too—his camera cases slung over his shoulder. I am known for my "statement making" heels. Rebecca and I worked to make a statement overall too that helped to support the Fortuna pumps’ vibe--part Rococo glamour, part punk attitude. I love the feeling of excess in her look. The volume of layered texture and color in the accessories, which pick up their cues from the shoes, but don't over power. The look here seems both vintage and modern to me at the same time--heavy but flirty too! I say if something is good, then it is often worth repeating. The repeating tassels of the belt she wore. The pin dots on the hosiery over and over. The reoccurring shapes, the dramatic overlay of metals. Powerful feeling. Urban tribal. We had a bright and brisk day as we walked. The gold leaves blowing across the side walks seem so similar to the gold armor clad heels and platforms of the shoes--like they were meant to be worn on days like this one. Such amazing weather this day that we got carried away on the time--and spent the last hour playing catch with the light. We paused in an interesting lit freight elevator when the light started to really fade, and a few good parting shots. By the time we got back to Rebecca's loft it was already past dusk--and we lost our battle for light. A few more snap shots in the grayness of her space and it was time to call it day. A big THANK YOU to Rebecca and Edwin for an amazing day! I hope all of you enjoy the results. Love the look!! So fierce...yet feminine. Beautiful shoes, have a great design. Wonderful collection of shoes. I like all the collection of shoes in this post. All are in great design. Please update your collection. Thank you!